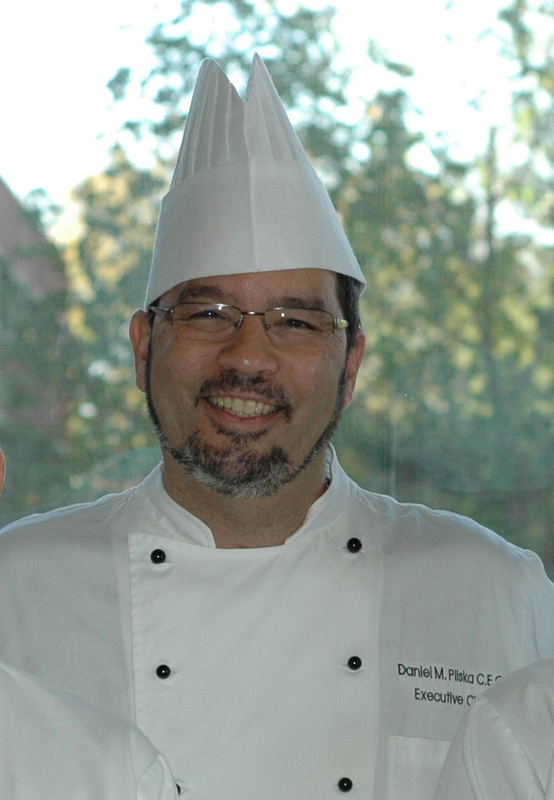 Daniel Pliska is the Executive Chef for the University Club of Missouri and University Catering located in Columbia, Missouri. He directs a kitchen staff of 25 to 30 at the Alumni Club of MU, and has been employed there since 1998. Dedicated to the practice, growth and training of traditional culinary and pastry arts, he is fortunate to be able to do this on a daily basis in his club and catering kitchens. In addition to being certified as an Executive Chef with the American Culinary Federation, he has received his Executive Chef Certification from the Club Corporation of America. He has been a member of the ACF since 1984 and has received 10 ACF awards and medals in cooking and pastry, including two grand prizes and a gold medal in traditional cold food competition. He was also nominated in 1999 for his chapter’s Chef Professionalism Award. Dan was recently honored with a Presidential Medallion at the ACF National Conference in Orlando. Q: Dan, tell us about how you began your career. Did you always know you wanted to become a Chef? A: When I was a teenager, I was a guitar player in a band and had dreams of becoming a rock star. My first job was as a dishwasher in the Washingtonian Country Club; I then changed jobs and went to a fish house restaurant where I was promoted to a fry cook. My plan at that time was to cook in the day and rock out at night time. Then one day after a trip to the library, I borrowed a book, “Classical French Cooking” – published by the Time Life magazine series. In it were photos of beautiful cold food buffets and presentations. In that flashlight moment, I thought to myself I want to really learn to coo. So I applied to the Sheraton Washington DC. It was a very large convention hotel with seven restaurants that could do banquets up to 5000. There I worked on the line in the gourmet restaurant and after a short time in that position, I was called into the Chef’s office (I thought I was in trouble for something). The Chef informed me that I would be needed to help with the opening team of the new Sheraton Hotel in Billings, Montana. After I was there for three weeks, I was asked to stay on as a sous chef and at 19, I jumped at the chance. After that I traveled to Germany, back to DC, and onwards to New Orleans, where I met my beautiful wife. At that time I was a traveling cook, if you will, out to absorb as much knowledge as I could from the school of hard knocks to find work with the best chefs I could find. Q: Dan, let’s start off with your recent award. You were recently honored with a Presidential Medallion at the ACF National Conference in Orlando. What does this award mean to you, and how do you think you earned it? A: I was very surprised to be honored with this award when my name was called during a luncheon for 600 people. I almost fell out of my chair! I was given the award for my dedication and support for the ACF and my current involvement with the ACF National Apprenticeship Committee. The medal, presented by ACF National president Tom Macrina, means a lot to me as it was unsolicited and recognition of my value to our federation. Q: Please tell us about a few of the food related events and programs that you have initiated at the school. A: Many of today’s top chefs travel to compete, go to conventions and seminars, do guest chef dinners, book tours, presentations, etc. Years ago I realized, like many of my contemporaries, I was blessed with the opportunity to make all of these connections and meet many great chefs. However, our staff and those in our local ACF chapter were not able to be part of these events to learn and make meaningful connections. So I decided to bring as many as possible back to our club, and with the help of our local chapter board we began to offer food summits. I started by modeling them from the concept of the World of Flavor Summits held in Napa Valley by the CIA. Our regional summits focused on Asian food, Latin food, Champagne and Chocolate, Farm to Table, and the Art of Food-Culinary Art in the Media. Q: You have enjoyed a stable career in clubs before transitioning to education. What have been some of the highs and lows during your career? Is there anything you wish you would have done that you didn’t do? A: Clubs have been great for me and for the record I am currently not in education. I still work as a club chef for the University Club and Catering of MU. When I was young, and out of necessity, I often worked two jobs. Since I was trained early in my career in both cooking and pastry, I was able to work in restaurants and pastry shops or bakeries at the same time – often cooking during the day and working in pastry at night. Those times were very grueling and hard on my young family. So I transitioned into clubs where I held the position as Executive Chef for Charlotte Country Club; then on to Club Corporation of America as the Executive Chef in the Capital City Club in Raleigh, North Carolina; and finally on to the University Club of MU where I have been the Executive Chef for the past 17 years. Sometimes I reflect back at some of the top places where I worked, such as working with Michelin Star chefs in Germany, DC, and New Orleans, and wished I might have stayed longer with some of them to gain more knowledge. Q: Do you have any advice for club Chef’s? A: Club chefs have to be careful not to become stagnant or complacent in regards to their skill development. Our lifestyle in clubs can at times become that way, and club chefs need to stretch and push themselves to never stop learning and sharing. By doing this, they will continue to remain passionate about the culinary profession and keep their members coming back for new culinary offerings and presentations. This will also enable the club chef to always be instrumental in building and enriching their culinary brigades in their own career development. Q: The word “organic” is being used widely in supermarkets. What are the benefits of buying organic? Is everything labeled organic truly worth a higher price? A: Organic is often an overused term with different meanings attached to different labels. I am not a nutritionist or a farmer, but as a chef I always strive to offer our members and guests the most nutritious and healthy food available. However, marketers are very clever and use different ways to make their produce appear to be the most healthful. Furthermore, the cost of organic foods, which can be quite expensive, is often too prohibitive for the price points that our members are willing to pay. Consequently, I have to make the best choices in purchasing that I can. I also believe that chemicals and preservatives used in the processed convenience foods are very unhealthy. Therefore we try to cook as much as possible from scratch without using processed foods. Q: What is your perspective on local and sustainable food? A: Sustainable foods, and locally produced foods, are what all responsible chefs should try to serve as much as possible. That being said, in many areas, mine included, there is just not enough variety and the growing season is just too short to offer local food on a consistent basis. During the season, we offer as much as possible. Sustainable seafood is very important to me – coming from the DC area and having worked in New Orleans, I have always loved to cook and eat seafood. Unfortunately many popular fish are under pressure of being fished out, and we must all do our best to educate our members and guests about more sustainable species. Presently we serve Arctic Char, Barramundi, and Black Cod, for example. We have also hosted three sustainable seafood multicourse dinners. Q: Executive Chef and Assistant General Manager at the University Club of MU/University Catering, you have an obligation to educate. Please share a little about your school, and how it contributes to culinary education. A: Unfortunately culinary education is not offered in the formal academic degree programs at the university – this is something that I would like to see changed in the future. MU does have a hotel restaurant management degree that we support and draw students from to work and do culinary and service management internships with at our club. What I am proud of is that while students go to school and work and train with us in our kitchens, they can become very skilled during their time in college. When a student adds this experience to their resumes, they become much more employable and are able to find work in high-end establishments and clubs. This is because we have a good reputation for training. Some of our past culinary staff has gone on to work in the Four Seasons, Ritz Carltons, Peninsula Hotel, Bellagio, Café Boulud, and Buchon – Napa Valley, and fine clubs as well. Q: What excites you about cooking in today’s world, as well as the future? In summary, at this point in my career I am most proud of our training and career path development that we offer at our club. At the center of this is our formal ACF apprenticeship program, as well as our Hotel Restaurant management internship program. We also support our local high school culinary program and employ and train their students. Three of these students have won the National Skills USA competition, two in culinary and one in baking. We also encourage ACF involvement. As I mentioned earlier, we have offered five culinary summits, three sustainable seafood dinners, and many dinners with guest chefs at our annual ACF President’s dinners. We also send out our top staff to culinary events and seminars when possible.